Located in Auchenflower, west of Brisbane’s CBD, our Munro Street Early Learning Centre is located in a spacious heritage-listed church that now boasts a brand new kitchen! 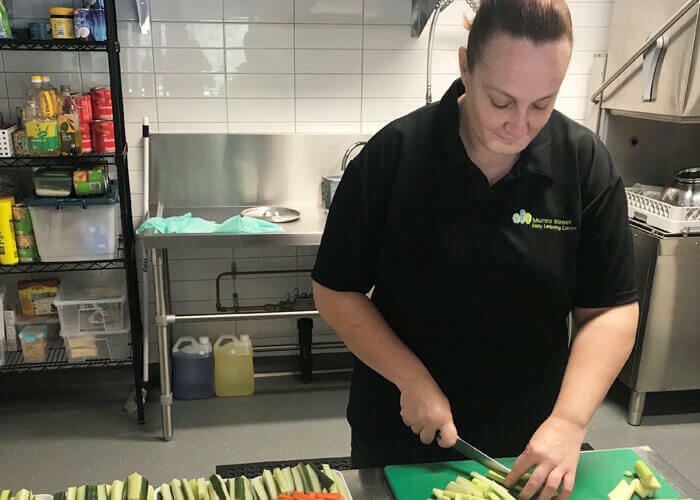 Cooking up a storm in this kitchen is Munro Street’s new chef, Kelly, who cooks and prepares four fresh and nutritionally balanced meals for the children every day. We take a few minutes to learn more about Kelly, her thoughts on nutrition and what she has in store for the children’s meal times at Munro Street. Welcome to Guardian, Kelly. Tell us a bit about your career background. I’ve enjoyed cooking professionally for the past 25 years, and personally since I was 15. For the past few years I have been cooking in the childcare sector. Prior to that, I have worked as a chef in three different countries, including being a head chef in a fine dining restaurant. You can obviously handle the heat in the kitchen. You must be enjoying making the new kitchen your own? It’s great to work in a brand new kitchen. In particular, I’m looking forward to using the commercial mixer. I used to do cake decorating part time, so I understand how awesome it is to have such a great piece of equipment to create meals with. We’ll be expecting some interesting creations with those cake decorating skills! What meals have the children most enjoyed so far? The children have enjoyed all of our meals, but they especially liked the pasta dishes and sandwiches. And of course, anything baked, like muffins or pikelets. I’ve really enjoyed creating the Munro Street menu from scratch. The centre has been able to cater to children’s needs individually, while ensuring they’re getting nutritious meals for their growing bodies and minds. The menu includes a casserole, stir fry and sandwiches. The menu sounds great! Why is there such a strong focus on serving children nutritionally balanced meals? It’s important to ensure that all children get nutritious and balanced meals while in our care. To help fuel their little bodies and help provide them with the nutrients needed to help their bodies and minds develop. If the children understand where food comes from, what it is, what it looks like, how it tastes and how it benefits their bodies, it will help them understand how important it is to have a well-balanced diet. Our approach to learning is developed alongside children, so it makes sense that our menu is developed in consultation with children too. Encouraging mindful eating is an important part of early food education. Including children in the cooking process would go a long way to the children being conscious consumers of what they eat. Did you have a favourite meal as a child? I have always been a huge fan of all foods (even as a child). If I had to narrow it down I would have to say steak and kidney pudding and prawn cocktail sandwiches are in my top two. I obviously grew up in England. It would have to be filet mignon, with potato and leek tart and garlic and thyme roasted mushrooms. Not very child friendly – but very adult friendly! Yum! What’s in store for the children at Munro Street? Next on the agenda is cooking classes! We’ve built the menu alongside the children, now we can develop their understanding of food through making nutritious meals together. Want to learn more about Munro Street? Head here to book a tour, meet Kelly and explore the kitchen for yourself!